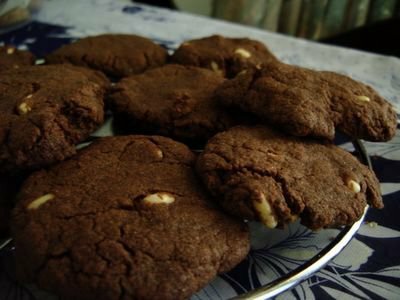 Chocolate Cookies with Pine Nuts – o frabjous day! This recipe is from Lucullian Delights, and although I had a little trouble with the quantities of ingredients, it’s a lovely rich chocolate biscuit, with surprisingly little work involved. I thought pine nuts were an unusual nut to use in a sweet biscuit, but they work very well. I’d recommend doubling the recipe amount here, as it didn’t really make enough biscuits for my taste. Beat together the butter and sugar until smooth, and then mix in the cocoa powder and pine nuts. I found at this stage that the mixture was too stiff to add the flour, and so I added about 4 tablespoons of water, and then firmly beat the flour in. Roll the dough into a ‘sausage’ and let it rest wrapped in plastic foil for an hour in the fridge, before slicing into 1/2cm thick circles. I didn’t bother to do this, and just squashed the dough into rough circles between my hands before putting them on a baking tray. Bake for 10 minutes, and after a couple of minutes out of the oven, cool on a rack. Hi!How strange to the see the cookies looking the same but on an unfamiliar plate!! I just wanted to say that there is a Cooking Measure Converter link on the left on my blog but may be you have already seen it! I know – I was really pleased that they looked exactly the same as your photo 🙂 And no, I didn’t notice the converter link – thanks for pointing it out. I used too much flour – I think I’ll amend this recipe.